Helioscreen outdoor blinds and external screens allow you to extend outdoor living areas while maximising the advantages of views from the inside. Our products will help you enjoy the Sydney weather and ambience in a soothing way! Helioscreen external blinds are designed to control the entry of natural light, heat and sun radiation from the outside. Easily and discretely fitted to home or commercial building in Sydney, Helioscreen outdoor blinds can also be installed inside a reveal during construction. Helioscreen external fabrics, Helio86, Helio93, and X-Screen come in a wide range of colours and are anti-static for easy cleaning. Depending on the fabric used, the benefits achieved with Helioscreen external blinds are improved insulation from heat gain and loss, UV shielding and reduction of glare. An opaque fabric can create a total blockout, or a sunscreen fabric such as X-Screen can offer sun protection, without losing the view. Helioscreen external blinds can have manual operation with a gearbox and crank handle or fully automatic operation by tubular electric motor. 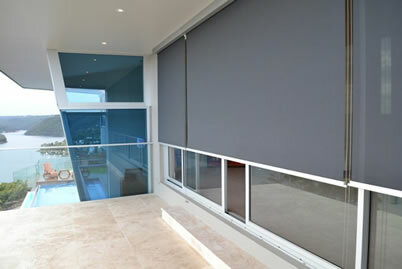 The motorised outdoor blind can be operated by a wall switch or remote control. A timer or sun sensor or wind sensor can further automate the operation. The Helioscreen external blind can be installed with a neat aluminium cassette headbox or as an open fabric roll without the cassette. The Helioscreen base rail travels up and down on optional slimline aluminium side channels or discreet stainless steel guide wires. The cassette and side channels are powdercoated to your choice of colour or contemporary anodised aluminium finish. As an alternative to side channels or guide wires, the base rail can be fixed down with clips and stainless steel saddles. Strong, reliable European engineering tested and proven with an optional powder coated aluminium head box cassette providing protection against corrosion and dirt. As with many of our products we have a range of systems to suit various needs. Below is a rough guide on how to best select a system for your individual needs. We recommend consulting with an Ozsun Helioscreen specialist before deciding on which system best suits your needs. Click on a Product Name to learn more. As with many of our products we have a range of fabric collections to suit various needs. Below is a rough guide on how to best select a fabric for your individual needs. 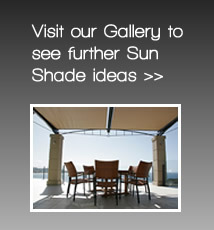 We recommend consulting with an Ozsun Helioscreen specialist before deciding on which fabric best suits your needs. Designed to control the entry of natural light, heat and solar energy from the outside, external screens allow you to extend outdoor living areas while maximising the advantages of glass. The Helioscreen crank operated external blind system is suitable for small to medium sized external blinds in both commercial and domestic applications. The system offers a discrete square headbox and a choice of powder coated side channels or stainless steel cables. A weighted base bar ensures ideal presentation of the fabric at all times. Helioscreen external systems will reduce the suns heat by up to 90% and come with a 3 year warranty. Designed to control the entry of natural light, heat and solar energy from the outside, external screens allow you to extend outdoor living areas while maximising the advantages of glass. The Helioscreen motorised external blind system is suitable for medium sized external blinds in both commercial and domestic applications. Motorised for maximum ease of use, this Helioscreen system can also be linked for maximum efficiency. Designed to control the entry of natural light, heat and solar energy from the outside, external screens allow you to extend outdoor living areas while maximising the advantages of glass. This stylish motorised external roller system is ideal for large sized blinds in a commercial or domestic application. The HM 80 110 is motorised for maximum ease of use and offers a discrete rectangular headbox and a choice of powder coated side channels or stainless steel cables. A weighted basebar ensures ideal presentation of the fabric at all times. Helioscreen external systems will reduce the suns heat by up to 90% and come with a 3-year warranty. Designed to control the entry of natural light, heat and solar energy from the outside, external screens allow you to extend outdoor living areas while maximising the advantages of glass. This stylish motorised external roller system is ideal for medium sized blinds in a commercial or domestic application. HM 65 105 ROUND offers a sleek and stylish round head box and a choice of powder coated side channels or stainless steel cables. A stylish teardrop base bar ensures ideal presentation of the fabric at all times. Helioscreen external systems will reduce the suns heat by up to 90% and come with a 3-year warranty.